Running to Stand Still: Thursday's uneventful last run as a 41yr old. Well, after a busy day at work, followed by food shopping at the Acme, I had to get my 6 mile run in. I'll tell you, running in the rain was fun yesterday, but today, running in low humidity & a light breeze, it was near perfect! I had a route saved in my runner's world online training log, that I was thinking of running, but it was short of the 6 miles that is on my training plan for Thursday's. I decided to add a short loop at the end. There was a bunch of runner's out and about tonite. I must have passed about 1/2 a dozen. Now when I run past other runners, I usually give a nod, or at least acknowledge the other runner. Most times it'll be a quick hand wave, but today, I guess the runners I passed either where fighting with their boss or spouse, because not one reciprocated my acknowledgement of them. Oh well, their loss. I for one, always take the second to show a little brotherly love to my fellow runners. Well, again, sounds old, but I felt great running. My wind is fine, legs are the 1st to feel the pain. Guess that will improve the more training I do. I did get acquainted with an old friend today. With the downpour I ran in yesterday, I gave my Kayano 14's the nite off, to continue to dry out, and dusted off my old Kayano 13's. I have read on the discussion board, at http://www.runnersworld.com/, that you should rotate your shoes, and shouldn't run in the same pair on consecutive days. I don't know how true that statement is, but I did want to make sure my 14's were completely dry. Well, I added on almost a full mile to the end of my run. I ended up running 6.63 miles in 56:17 (8:30/mile). I am looking forward to taking Friday off. Not only is it a scheduled day off of running, but a certain marathon trainee turns 42. 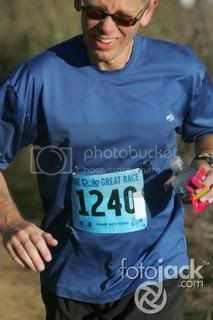 Happy B-day dude - 42 is a good year for a first marathon, enjoy it. What is up with the runners? I am the same as you. Happy Birthday. Have a great day!!! Dont you just love those days where everything just feels right? Blissful runs are the BEST. Have a great weekend and happy birthday!!! Oy, that's a pet peeve of mine. Not waving or smiling back. Seriously you can't put forth the minimal energy to smile or wave back? BAH! Nice blog. As you can see we are on a similar path towards marathons about 20 days apart. Happy Birthday! See.. you got perfect conditions for you last run at 41. I am not much of a believer in the rotation thing.. but if you have two pairs then I guess why not. Happy Belated Birthday dude!!! Like you, I do rotate my shoes quite a bit which I think its beneficial. Like you, I have a tendency to give a "Friendly" wave to other runners. (At least, I can burn an extra calories just by doing a little bit of waving.) Some do return. Some ignored me. It is their problem, not mine. I used to think they are narcissistic. Anyway, hope you had a good Birthday celebration. Hey sorry I missed your B-day, just a couple of weeks after mine. You got lost in the "clutter" of my bloglines. Hope you enjoyed your day.